The Big Picture: Rebuild is well and truly underway! 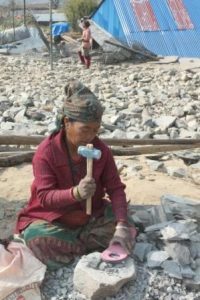 NAFA’s focus in 2016 was helping remote villages rebuild infrastructure destroyed by the devastating earthquakes that struck Nepal in April and May 2015, After allocating nearly $100,000 in 2015 to NAFA’s initial responses (provision of medical supplies, roofing tin, rice and tents) we allocated approximately $448,000 to earthquake rebuild/repair projects in five districts of Nepal: Dhading, Solu Khumbu, Okhaldhunga, Dolakha and Sindulpulchowk, as well as $27,000 for related earthquake training and engineer overseeing of construction. It has been a challenging process, requiring approvals from three departments in the Nepalese Government, both at a central office and district level. The Social Welfare Council has also now gotten into the act adding another hurdle to jump. However, this means that NAFA supporters can be assured that what is being built meets Nepalese government requirements and we have done our best to build infrastructure that will resist damage and potentially deaths from tremors and earthquakes in the future. While our focus in 2016 was on earthquake related matters, we also continued to support ongoing programs from funds raised separate from the earthquake appeals. In 2016 NAFA allocated $43,330 to 13 ongoing programs and nearly $33,000 to 5 one-off projects separate from our rebuilding allocations. Altogether NAFA allocated a staggering $550,000 to projects in Nepal, a figure that I am sure will never be surpassed. This is the ninth year in a row that NAFA has allocated over $100,000 to projects in Nepal, a wonderful record for this small, volunteer run development aid organisation. Apart from our earthquake rebuild responses, NAFA allocations spanned the priorities of education, health, child care and rural economic (agricultural) development. NAFA’s donors continued to open up their hearts in 2016 in response to the earthquake and in support of our other ongoing and one-off projects. Approximately $187,000 was donated for earthquake rebuild projects. This includes donations made through a successful crowd-funding campaign undertaken at the end of the year. NAFA also guarantees that 100% of donations to NAFA go directly to Nepal, without any administration expenses taken off. In 2017 I hope we will raise sufficient funds needed to complete the rebuild process, and that will continue to be our priority. With allocations nearly completed for rebuild/repair commitments in the Solu Khumbu, Okhaldunga, Dolakha and Sindulpulchowk districts, our focus will be on completing the rebuild commitments in the four villages of Ri VDC, Dhading district. Schools in this area were completely destroyed by the Gorkha earthquake in April 2015 as they were located only 20-30 kms from the epicentre. The rebuilding program in Ri VDC needs two building seasons to complete, subject to the availability of funds in 2017. All NAFA projects are locally managed and NAFA will continue to expect the local community to make a contribution towards each rebuilding project, for example by undertaking volunteer labour to build retaining walls, excavating and clearing the building sites, transporting building materials from the road heads to the school sites and breaking down stones used for aggregate in the concrete mix. At the same time, NAFA recognises the economic hardship and emotional stress caused by the earthquakes so it will continue to be flexible in its expectations of community contributions during this time. I travelled to Nepal twice in 2016, focussing on the rebuilding phase and to monitor ongoing and one-off NAFA projects. Executive members Deborah Setterlund, Ross and Brenda Hazelwood, Russ Waller, Jo Bicknell and Wendy Eastwell, along with other NAFA supporters, also visited NAFA projects at their own expense to monitor project implementation. · Nearly $18,000 allocated to 7 health projects and programs, including salaries for 3 health workers in a remote health clinic, primary hearing care, a remote screening and cataract eye clinic, health clinics in a carpet factory and a women’s personal hygiene project. · $14,000 allocated to teacher salaries in two remote villages and $9,200 allocated to support three child care centres for poor families. · Nearly $21,000 allocated as education sponsorship for 59 children up to Grade 10. · $47,500 allocated in sponsorships for 35 students for college (Grades 11 and 12) or Bachelor level study. · $23,106 grant received from English Family Foundation for the re-establishment of the Pasang Chowk Agricultural Cooperative (Tawal area) comprising approximately 400 families from four villages. · $6,853 donation from Queensford College for a tailoring training and establishment program in the Tawal area. The Government of Nepal required international NGOs to register their offer to support the rebuilding of school classrooms with the Department of Education (DoE) through a local NGO (in NAFA’s case Speedway Foundation for NAFA rebuilds in the Solu Khumbu Okhaldhunda and Dolakha districts and the Hilly Region Development Club for NAFA rebuilds in the Dhading district). We also required approval of the classroom designs from the DoE and the Department of Urban Development and Building Construction (DUDBC). We have to submit technical engineering reports both at a district and central office level to the DUDBC and the Central Level Planning Implementation Unit (CLPIU) set up to monitor construction of earthquake resistant community assets. Finally we now have to seek approval from the national Social Welfare Council (SWC) which requires the submission of project proposals, program logics and the payment of an “inspection” fee at the end of the rebuild. NAFA has been very fortunate to have members of the Nepalese community in Brisbane connect us to professional people in Nepal who provided assistance for our earthquake rebuild program. We contracted (at very little cost due to his generous nature) a geotechnical engineer, Professor Megh Dhital from Tribhuvan University, to travel to the Ri VDC to undertake a “rapid assessment” of 25 villages and provide advice on where it was or was not safe to rebuild. Following his advice, in 2016 NAFA funded a 5 metre high by 50 metre long gabion wall to protect the area school at Tawal from risk of landslide. NAFA engaged a Kathmandu-based Nepali architect, Mr Sabin Shrestha, to design the classroom blocks being constructed in seven villages named in our MOU with the DoE. In November 2016 NAFA funded two seven day earthquake resistant training programs for a total of 34 builders and school construction committee overseers conducted by two engineers and a stone mason from the government accredited Institution for Suitable Actions for Prosperity (ISAP), with Mr Pankaj Parajuli being NAFA’s contact in ISAP. Building designs for the classroom blocks are complex and a two storey design is needed for two villages due to a shortage of land in one village (Kutal) and to ensure the location is the safest from landslide risk (Tawal). There are also different sizes of classrooms due to different class sizes and we are building, two, three and four classroom blocks in this first stage of rebuild. Most builders hadn’t been trained in earthquake resistant building and therefore required both building theory and practice in these techniques. Due to the complexity of ordering building materials in accordance with the classroom design, and the need for official reporting requirements, the decision was made by the NAFA committee to engage two overseeing engineers on a five month contract to live up in the two areas NAFA has rebuild/repair commitments. 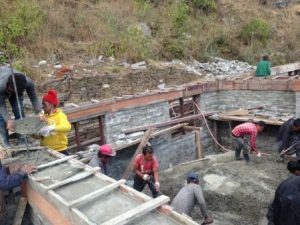 Surendra Budhathoki and Sadit Maharjan have played an important role in supporting the rebuild at a local level, ensuring both quality and efficiency in construction. In two villages (Ladap and Tawal) private land adjoining the school site had to be purchased and excavated, funded by NAFA and the local communities. Significant retaining walls also had to be constructed in Kutal, Tawal, Ladap and Patle. Local communities in all villages have made significant volunteer efforts to the rebuild, constructing retaining walls, excavating and clearing the construction sites, making aggregate, carrying materials from the road-head and clearing the sites following construction. In 2016 NAFA also funded the rebuild of the Pasang Agricultural Co-operative infrastructure in Dushene, Ri VDC, originally built with local community funds and destroyed by the April 2015 earthquake. This included two chicken sheds, a caretaker’s cottage and reconnection of water and electricity. NAFA also funded the rebuild of a small forest shelter for those having to walk so far to gather wood for their cooking stoves. 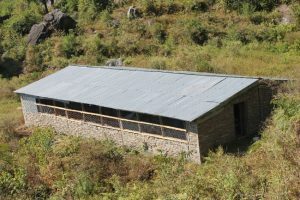 NAFA has used a general benchmark budget of AUD $10,000 (net of volunteer labour and re-use of building materials) per classroom for the rebuild. This benchmark was based on a cost estimate prepared by the architect. We have also worked hard to find like-minded partners who have so far agreed to fund six of the 35 classrooms NAFA had committed to rebuild in the Ri VDC. We are hoping to raise and allocate sufficient funds in 2017 to complete NAFA’s rebuild commitments. Working together with our Nepali friends and partners and with ongoing support from donors, NAFA is determined to fulfil our commitment to the people in rural areas who have stoically endured great hardship since the 2015 earthquakes. 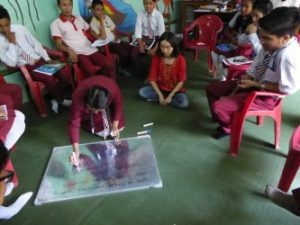 NAFA has one child sponsorship programs at Vinayak Shiksha Niketan (VSN) School in Thimi, with the number of children sponsored for education by NAFA up to Grade 12 now totalling approximately 60 children. This program is now capped due to the administratively responsibilities associated with these programs and their multi-year impact on NAFA’s financial commitments. NAFA’s focus now is beyond the student’s success in passing the national exams held at the end of Class 10 to obtain their School Leaving Certificate (SLC). They face enormous disadvantages from their backgrounds to continue past this minimum academic qualification. In the case of VSN Thimi, sponsored children are from poor families in this pottery/farming town, with many of the sponsored children’s families working and living in a local carpet factory. Most of the children in Prisoners Assistance (PA) Nepal in Sankhu have parents who are in prison or are orphans. NAFA also provides post Grade 10 FEAT support to students from a number of villages who attend the area school at Tawal. These students are from poor subsistence farming backgrounds. NAFA’s FEAT program aims to partner with child sponsors and families to provide opportunities for young people involved in NAFA supported education programs to undertake vocational training or post Grade 10 (college years 11 and 12) and Grade 12 (Bachelor) study to improve their employment chances. In 2016, funds were allocated through the FEAT program to support 35 students in post Grade 10 study. This number continues to increase as more children formerly supported under the child sponsorship program move into Bachelor level study. Through the FEAT program, NAFA is now supporting young people from VSN, PA Nepal and Tawal to study medicine, public health, fashion design, nursing, education, rural health, hotel management, business studies, mechanical engineering, computer engineering and geographic engineering. NAFA continued its financial support to two child care centres operated by the Butterfly Foundation in Pokhara. These centres support families who have moved to Pokhara from villages in search of casual day labour work. In addition, after funding its establishment in 2011, NAFA continued to support the operation of a child care crèche for carpet factory families in Thimi as a response to an evaluation of the health clinic and child sponsorship programs in Thimi in 2010. Since the earthquake that crèche was relocated to an abandoned primary school and seems to be operating well from that venue. Since co-funding (with AusAid) the construction of the health clinic in 2000, NAFA continues to subsidise the salaries of three health workers at the Tawal health centre, which provides primary health care to over 3,000 people living in Tawal and 4 other nearby villages. Following the earthquake they saved the lives of a number of injured earthquake victims. Unfortunately the health clinic at Tawal was completely destroyed by the earthquake and will have to be rebuilt on land away from the landslide prone area on which it had been built. A successful crowd funding campaign in 2016 has raised sufficient funds to purchase private land and rebuild the health centre. However at this stage suitable land at a reasonable cost has not been able to be sourced. In the meantime, the health centre has moved from a tent to be temporarily housed in emergency accommodation rooms built by the Nepal army in case of future natural disasters. That will be a dry place to operate from until suitable land can be sourced and the new health centre built. Since 2010, NAFA has been a proud supporter of the Himalayan Health & Hearing (HH&H), developed and conducted through the dedicated volunteer work and financial generosity of Lew and Sue Tuck from Whitsunday Hearing. Lew and Sue work in partnership with Keshab Dangol from the Nepalese Association of Hard of Hearing (NAHOH), which is also supported by NAFA, and medical staff in Shechen Clinic and Hospice to provide hearing as well as general and specialist health care in outreach camps in the Kathmandu Valley and beyond in remote areas of Nepal. HH&H have been implementing a network of service “hubs” in essentially become training centres for other local primary hearing services. HH&H supports their training with the aim of providing safe, continuous and sustainable primary ear care services in high need areas of Nepal into the future. NAFA support for hearing screening and treatment complements nicely NAFA’s support of eye care through its long standing support of Tilganga’s eye screening and cataract surgery remote clinics. In 2016, a three day clinic was held in November at Dhading Besi, with over 1,000 people screened and 119 cataract surgeries performed. In 2016 NAFA was fortunate enough to secure a grant from the English Family Foundation (EFF) that helped re-establish the Pasang Chowk Agricultural Cooperative in the Tawal area of Ri VDC, Dhading district. After NAFA, through earmarked donations from its supporters, provided funding to rebuild the physical infrastructure destroyed by the April 2015 earthquake, the EFF provided the funding for a number of initiatives that enabled the Cooperative to get back on its feet. These initiatives included: subsidising the caretaker’s salary for 12 months; training and provision for follow-up training in cardamom growing, the purchase of 20,000 cardamom plans for 81 households planning to grown the cardamom spice, coffee growing training for the 25 farmers who are growing coffee, goat rearing training and a pilot “developed” goat project for ten women that includes the purchase of ten higher value “Jamuna” goats and construction of goat sheds for those goats; solar for the chicken house and the restock of both egg-laying and broiler chickens. Establishment of the Cooperative, along with micro-hydro electricity are two initiatives that are making a real difference to the economic future of the four villages in the area who are thus far participating in the Cooperative. The timing of the initiatives, coming soon after the earthquake has also been instrumental in helping villages devastated by the earthquakes to recover and improve their lives. Another initiative aimed at increasing the income of poor women in the Tawal area funded in 2016 was the tailoring training project, funded by a donation from Queensford College. 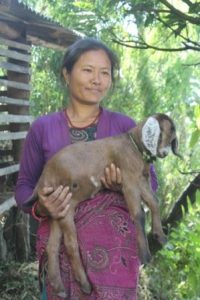 This initiative, along with the goat initiative, are components of NAFA’s efforts since 1998 in providing a community development approach in the Ri VDC, with a particular focus on women. The aim of this project was to assist local women in learning valuable sewing skills in a group setting, enhancing women’s participation in development and creating more self-sustainable community economic development outcomes in the area, A master tailor was sourced through the district woman’s skill development office which is overseen by the district government. Twenty women participated in the training, sharing ten sewing machines purchased through the initiative. I facilitated a workshop on business skills needed to run a small tailoring business, which was well received, generating a lot of discussion within the group. Deborah has started working with the women to look at options for advanced training and products that could be made for markets outside the area. Finally, it was another busy year for distributing jumpers and beanies knitted by approximately 120 women in Brisbane. Two hundred and twenty jumpers and beanies were distributed to school children in Kophu, Solu Khumbu, 340 in Patle, Okhadhunga district and 100 at a school in Changa Narayan Bhaktapur. One hundred and fifty beanies were distributed to school children in Ladap and Richet in the Dhading district, with left over beanies too large for the young children distributed to older residents in Tawal. A total of over 810 jumpers and beanies were distributed to students in earthquake affected areas. 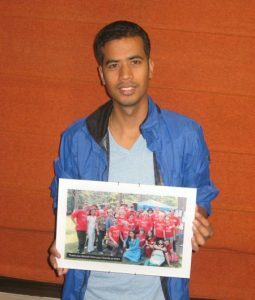 I would like to make some specific heart-felt thank you’s to supporters here in Australia as well as those who have made NAFA achievements in 2016 possible in Nepal.. In Australia, I would firstly like to thank NAQ and members of the Nepalese community for again supporting NAFA so well this past year. This support includes substantial assistance with NAFA’s main fundraising events, advice on a range of earthquake related matters and making connections with professional expertise in Nepal needed in the rebuild. NAFA committee members and regular meeting goers Nirmala Pandeya, Mana Ranjit and Ujjwal Gautam provided sound advice and loyal, consistent support during what was a very challenging year. Mohan Sharma’s (NAQ President in 2016) wise counsel at meetings and in between meetings, was also invaluable and greatly appreciated. I would like to offer a special thanks to Ujjwal Gautam. He has been Treasurer for eight years, cheerfully doing does what needs to be done in the financial management area. In 2016 he again recorded many, many transactions in a very busy year, as well as keeping a database on tax receipts issued. His professionalism and accuracy in recordkeeping was again commended by NAFA’s auditor. Ujjwal has indicated that it is time to hand over to another Treasurer and we will be forever grateful for his professionalism and consistent support that he has provided over so many years. 2016 was indeed a busy and challenging year for NAFA’s Management Committee. I would like to thank, in particular, a number of new management committee members who came at a busy time and played invaluable roles. Thanks in particular goes to Jo Bicknell, who took on the child Sponsorship Officer position, Rick Parkes for taking on the Assistant Treasurer’s position, Russ Waller who took over responsibilities for drafting agenda papers and taking the minutes at NAFA meetings as Assistant Secretary and Stephanie Boldeman for taking on the role of Mailchimp and Membership Officer. I would like to again make special mention of the contribution that Ross and Brenda Hazelwood make to NAFA, both in Australia and in Nepal. They work hard in Australia in their formal committee roles but they also help with other tasks that keep everything moving. Their time in Nepal has also been particularly important since the earthquake where Ross has used all of his persistence and commitment to guide NAFA’s earthquake rebuilding efforts in eastern Nepal, while at the same time supporting Jo with tasks associated with the VSN and PA Nepal child sponsorship and FEAT programs. Ross has decided to vacate the Secretary’s position at this AGM, a a position he has held since 1999 to give someone else an opportunity to take up this role. Ross will continue to play a leading role in NAFA, not only as Nepal Projects Coordinator for eastern Nepal and Sindulpulchowk districts but also for other invaluable fundraising event-related support work in Australia. Apart from supporting Ross in his efforts related to the rebuild and child sponsorship/FEAT programs, Brenda spends time in Nepal purchasing goods for the NAFA market stalls and coordinating the jumper and beanie program. In September 2016 Brenda informed the committee that after many years she would need to bring the knitting program to an end. A combination of increasing numbers of jumpers, decreasing numbers of people heading to Nepal and storage problems meant the program was no longer viable. It has been a popular program and I thank Brenda and Ross for all the work they have done in coordinating it over the years. NAFA market stalls are a reliable fundraiser for NAFA, with nearly $14,500 raised in 2016. It is great credit to those involved in purchasing the items and organising the market stalls, including Brenda Hazelwood, Debbie Leigh, Deborah Setterlund, Megan Richardson and Wendy Eastwell in particular. Megan consistently raises approximately 20% of our market stall income from a small town in New South Wales. Her energy, commitment and loyal support to NAFA and to Deb and I personally is so admired and appreciated. A long-time NAFA supporter, Margaret Hounslow, also organised a successful “pop-up” market stall in 2016 and we always encourage such innovative ideas from our members. Good on you Margaret. Other NAFA management committee members help with NAFA’s main fundraising events and with other important management and administrative tasks. I would like to again this year make particular mention of Peter Brockett and Stewart Jones for their expertise and good cheer in undertaking important tasks associated with NAFA’s two main fundraising events, the Nepalese New Years fundraising dinner in May and Nepal in the Park in August. Peter has also expressed the need to handover Event Coordination responsibilities to the “next generation” and I am again so appreciative of the part he has played in helping to plan and implement important NAFA fundraising events. The Committee is blessed to be supported by a large number of volunteers who help with these events. These include the distinguished “Red Shirts” who are visible at the Nepalese New Years Dinner and Nepal in the Park. As has been the case over a number of years, Backtrack again provided great support to NAFA during the year, including printing and photocopying as well as selling tickets for the dinner. In 2016 NAFA committee members and regular meeting goers started a process of succession planning and sustainability for the day sometime in the future when Ross, Brenda, Deb and I will no longer be able to undertake the activities we do here in Australia and in Nepal. Rick Parkes prepared a “Green Paper” and special meetings were organised to discuss issues and strategies identified in the Green Paper. That process will continue in 2017 and I would like to thank in particular Rick, Russ Waller and Mary Hockaday for the roles they have played in driving and co-facilitating meetings on this matter. One of the ideas that have come out of this process has been that of “Project Champions” for innovative new projects. 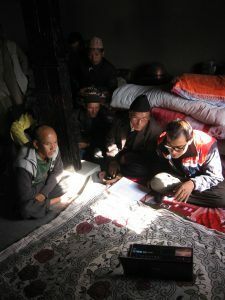 One idea proposed in 2016 was that proposed by David Brown to explore the feasibility of solar power in remote villages, Further exploration of that idea is expected in 2017. In Nepal, our Project Coordinators volunteer their time to help their communities. It was another busy and challenging year for them: Phurba Sherpa for the Solu Khumbu/Okhaldunga/Dolakha districts; Chandra Tamang and Kanchha Tamang for NAFA supported villages in the Dhading district; Surendra Prajjapati in Thimi; and Govinda Pahari in Pokhara. Thanks also to Pradip Shrestha and Uttam Shrestha for providing administrative and IT support to NAFA from the Joy office. In this report I have previously made mention of the important contributions made by an architect in Nepal, Sabin Shrestha and by the two overseeing Engineers, Surendra Budhathoki and Sadit Maharjan. Similarly, Manish Bhadra, HOD Administration of the Speedway Foundation continued to provide invaluable support in helping guide NAFA through the DoE/DUDBC/CLPIU/SWC bureaucracy. 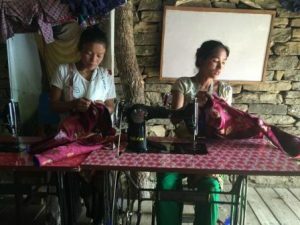 A special thanks to Pratika Shakya from the Joy Foundation Nepal office who accompanied us to Tawal and supported Deb in particular with translation and general advice on Cooperative and tailoring related projects. We were also fortunate to have two University of Qld social work students, Avalon Wood and Minghan Deng do their final field work placement with NAFA, supervised by Deb Setterlund. Minghan and Avalon with the help of Pratika Sakhya from the Joy Foundation worked on the following activities: delivering a Life Skills Program at VSN School; doing exit interviews with FEAT students; and evaluating two women’s economic development programs at Tawal – goat rearing and breeding (Avalon) and tailoring skills training (Minghan). We thank Avalon and Minghan for their valuable contribution to NAFA’s programs and wish them well in their social work careers. I would also like to take this opportunity to thank Graham and Bronwen Solley, long-time NAFA supporters, for coming to Tawal with us in November and providing invaluable support to the NAFA team’s assessing and monitoring efforts there. I have been President of NAFA for ten years. As I indicated at last year’s AGM, I would like to stay in the position until the rebuilding phase is over, which should be by the time of next year’s AGM in April 2018. I fully support the current “succession planning and sustainability” process and have prepared a number of documents in support of that process. These include the preparation of Event and Project Role Matrix documents, a “Who’s Who in Nepal” document and a package of committee role statements. NAFA is a very special organisation. If we plan and implement our succession planning well, NAFA will continue to make a real difference to people’s lives in Nepal for many years to come. In the meantime, in 2017 let’s complete and celebrate the very ambitious rebuild commitments NAFA made after the earthquakes.